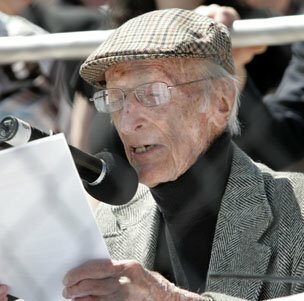 NEW YORK — Bob Sheppard, the iconic Yankee Stadium public address announcer whose impeccable introductions of stars from Joe DiMaggio to Derek Jeter earned him the nickname “The Voice of God,” has died. He was believed to be 99. Sheppard started with the Yankees in 1951 and he last worked at Yankee stadium late in the 2007 season, when he became ill with a bronchial infection. He recorded a greeting to fans that was played at the original ballpark’s final game in September 2008, and his audio recording still is used to introduce Jeter before each at-bat at home by the Yankees captain. A very sad day for New York sports. Let’s not forget that this is a sad day for the Giants as well. Along with being the Yankees PA announcer for over 50 years, he was the New York Giants PA announcer from 1956-2005. When Sheppard retired late in the 2007 season, an era of New York baseball came to an end. But today it has become official. Yankee baseball never will be the same. Every Yankee fan remembers their first Yankee game and hearing Bob Sheppard as they walked into the stadium for the very first time. Sheppard’s voice is what made a Yankee game such an unbelievable experience. Even though the Yankee teams have changed throughout the decades, the tradition has never changed, thanks to the Voice of God. I have to admit, I thought Bob Sheppard was immortal. Ever since my first Yankee game in 1993, the guy has been old. But there was something about him that made me believe he would never die. I knew he was pushing 100, but I thought he still had at least another 10 years in him. R.I.P Bob Sheppard. P.S. There better be a Bob Sheppard statue being built outside of Yankee Stadium as I’m writing this. This entry was posted on July 11, 2010 at 12:49 pm and is filed under Yankees. You can follow any responses to this entry through the RSS 2.0 feed. You can leave a response, or trackback from your own site.